Muffins for breakfast? Yes, please! 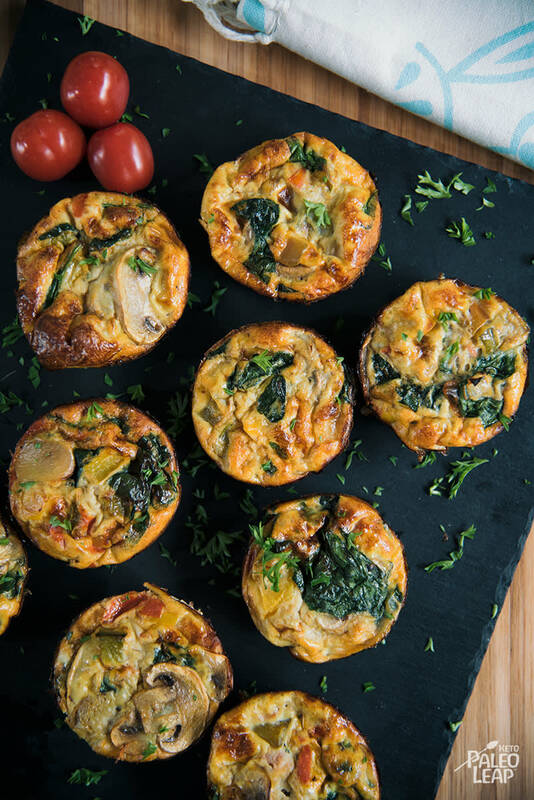 And these frittata muffins are so darn tasty that we know you will be taking them to munch alongside your lunch salad with herb dressing too. If a grilled eggplant and sun-dried tomato salad is more your style, or take-to-work option, then know it matches that in flavor too. This recipe is with vegetables only and we must admit, sometimes it feels good, even refreshing to eat a meatless meal. However, if your day is busy and you need to add a bit more protein or fat to your muffins, then some bacon will do the trick to give you that energy boost you desire. You may even fry up a sausage – chill it and chop into bite sized pieces – that you can add to each muffin cup. We suggest baking up a double batch in the evening to save precious time in the mornings, as they will keep for a few days in the fridge in an airtight container. They can be frozen too, so when you don’t know what to eat, or simply don’t have time to cook a healthy breakfast at home, just thaw them thoroughly and reheat as many as you need to fill your hunger at once. One more dinner idea – keto egg muffins also pair well with a generous side of cumin-cooked cabbage to keep you on headed straight on your low-carb way. Melt some coconut oil in a skillet over medium heat, and cook the onion and garlic until soft, 2 to 3 minutes. Add the bell pepper, mushrooms, tomato and cook until soft, about 2 to 5 minutes. Add the spinach, season everything to taste, and cook for another minute and set aside until cool. Whisk the eggs in a bowl, add the cold vegetable mixture to the eggs, season to taste, and whisk everything until well incorporated. Fill each muffin tin about 2/3 full with the egg mixture. Place in the oven and bake 18 to 20 minutes, or until set.